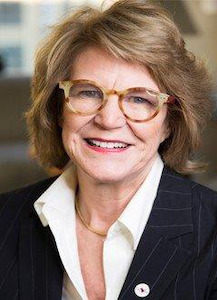 As Katherine “Shelley” Broderick prepares to step down this summer as dean of the University of the District of Columbia (UDC) David A. Clarke School of Law, she reflects on her law career that began more than 40 years ago. There were two defining moments in her life that pushed her to become a lawyer. After her brother was wounded in the Vietnam War, she became outraged and believed that legislators and lawyers needed to push for change. Second, she was heavily influenced by the Civil Rights Movement and Dr. Martin Luther King, Jr.
From a small fisherman’s village in Maine, Broderick moved to Boston with her family at the age of 11. Four years later, her family moved to Manhattan. Following in her sister’s footsteps, Broderick decided to move to Washington D.C. and eventually chose to attend American University. During her time at American and a few years after, Broderick worked with inmates who were within six months of release at a halfway house and then at a local prison in D.C. Broderick’s experience with the inmates inspired her to become a criminal defense lawyer. Broderick knew that she wanted to teach and actively sought out fellowships and clinical programs. She eventually was selected for a fellowship program at Antioch School of Law, working at a consumer rights clinic. Eight months into her fellowship, she took over the criminal defense clinic, which she led for 10 years. After Antioch decided to close its law school in 1986, Broderick and others went down to city hall to fight for it to remain open. Throughout her career, Broderick had seen D.C. develop from a “sleepy southern town” to a “world-class international city.” However, she still wants to see D.C. obtain voting rights and become a democracy. In 2016, D.C. Mayor Muriel Bowser asked Broderick to serve on her legal team to draft a new constitution for the statehood of D.C.
She has received many awards and accolades throughout her career, including the Thurgood Marshall Scholarship Fund’s “Educational Leadership Award” in 2016 and the National Bar Association’s “Heman Sweatt Award” in 2017. Additionally, among many other accomplishments at UDC, she secured the highest level of American Bar Association accreditation and forged the first Memorandum of Understanding between the University of Havana and any American law school. Broderick has traveled around the world to learn more about other countries’ legal systems. Broderick made the decision to step down as dean this year and will be taking a one-year sabbatical before returning to UDC as a faculty member. In January, she will be leading a law delegation in Vietnam and Cambodia with many alumni and friends. This is the first in a series of stories about Law School deans. This article appeared in the July 12, 2018 issue of Diverse.